Why did he teach us so much? But then again who was he not to? Was he teaching us all along, and we were just to blind to see it? ~The protagonist in The Way Brilliant Souls Cry is a great performer and artist who wants only to love-and to be loved in return. But his relationship with the mentally wrecked, bipolar Katrina threatens to destroy him.Following one of his shows, the artist is approached by Katrina's father, Richard. The man makes a plea for the artist to visit Katrina in the hospital-claiming that he is the only one who can bring her out of her depression. The artist has always loved her with all his being and agrees to visit her.Shortly after, the two troubled souls become engaged and embark on a month long holiday in Europe. Upon their return, he throws himself wholeheartedly into preparing another show. But shortly after the show opens, the couple's relationship starts to unravel. Katrina and the artist break up and reconcile many times until their final ending is tragically realized.This is a story about the human need for love as told from the perspective of the artist's friend Luna. The Way Brilliant Souls Cry is the depiction of madness-turned-genius and back again; it examines the gifts that our lives give to other people and illustrates how pain isn't always easy to recognize. ~Of course I wonder why he did it, and without so much as a cry for help, or even noticeable changes in behavior to give us some clue, some hint at his inner state, his torment. No, that would be asking too much of him to be honest with us. You see, he was not only a great performer on stage, but off stage as well. After his self-admission and release from a mental hospital, Colin Zwiebel decided to direct his energies toward healing himself by writing. Haunted and tormented by the traumas of his past, he now transforms them into allegorical fiction. A strange yet beautiful perception of a bipolar personality in love. The narrator sometimes feels as if hes personally talking to the reader almost poking at you as if your sharing a private joke. I really enjoyed that bit of madness. It created beautiful visuals for me that at times i felt as if I was the character. An easy read and worth taking a moment to self explore a dark side and see the gleam of light that come from doing so. The end is worth the read. Colin Zwiebel's masterpiece is a poignant insight into the workings of the mind and the destruction of brilliance against an unaccepting world. The elements of love and loss and of forgiveness are incredibly compelling. A debut worthy of public notice, it lends one to ask what more he has to offfer. Highly recommended. 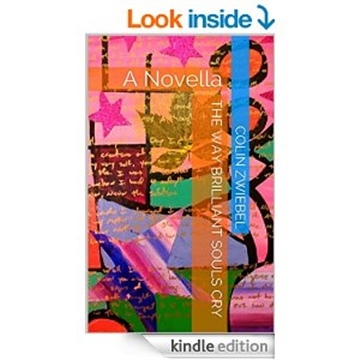 The Way Brilliant Souls Cry is a novella told in only one voice, that of the narrator. It is a story of love and madness, and how the two intertwine and sometimes become each other. It is well written, hard to put down - I read it in one sitting. Even though the narrator is the only voice speaking, her descriptions of the two other main characters are perceptive, and the author's understanding of bi-polar mental illness creates the background for the madness of all three characters. There are errors in grammar due to the author's not being a native English speaker, but they don't detract from the story. It's something I would recommend to other serious readers, and something I'm sure I will read again. I've enjpyed this, and am delighted by the very modern, almost deconstructist treatment of the dialogue of a man dealing with shock, hurt, grief. I believe the format is meant to be that of a play--this is exciting to me as there are only dashes to indicate new ideas, events, it seems as though the protagonist is simply having a dialogue within himself, a conversation with existence itself. It's so delicately written, don't miss a word lest you misunderstand. He wants you to understand, badly. I was delighted to see something so new in these modern times. Beautiful, deep, moving, unsettling. These are the four words that struck me most to sum up the book as I finished reading the final page. A wondrous journey, I couldn’t wait to see how it would end, yet at the same time I never wanted the ending to come. Quite a curious feeling but altogether thoroughly enjoyable. I know I’ll go back and reread before long, but for now I’m happy to allow my feelings for The Way Brilliant Souls Cry time to settle as I reminisce about a novella I really loved. 1.0 out of 5 stars Liar. This is the best and worst book ever written. The author is a non-assuming megalomaniac.....it would make a hilarious movie.